What better place to spend your morning than at the farm soaking up the sunshine, fresh air and beautiful outdoors? Enjoy these precious moments with your little one, filled with memories that will last a lifetime. Story time begins under the Market barn at 10:30 am. Enjoy a blueberry craft after story time starting at approximately 11:00 am. Farm wagon rides available from 9 am to 12 noon. $2/person, children under 2 are free. Story time and craft are geared toward pre-school aged children, however anyone is welcome to attend this event. 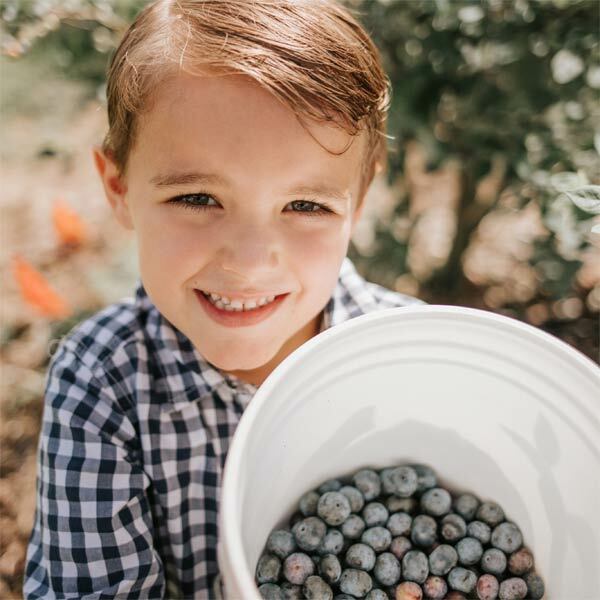 Blueberry picking on forty acres with eight varieties to choose from. Enjoy blueberry donuts, blueberry muffins and other sweet treats from our bakery. Shop for local, handmade items like our sugar scrubs, blueberry jam, local, raw honey and more in our Southern Hill Market. Our covered playground is available all day, as well as our picnic tables under our shaded barns. We’ve got permanent restrooms and baby changing tables in both the men’s and women’s restrooms. No outside alcohol, coolers and catered meals. Visit our FAQs page or things to do for more information about the farm.